The Fantastic Four are the greatest 50’s B-Movie never filmed. Smart guy, tough guy, punk kid, and girl. In their first four issues they fight an underground kingdom, aliens, an “evil wizard,” and a more humanoid, smarter version of the Creature from the Black Lagoon. All of whom either have or become giant monsters along the way. Agh :) I said the 70’s one :) Still, this one wasn’t really that bad, either. The 1970’s series had H.E.R.B.I.E. in it instead of the Torch — but the 60’s version was pretty nice, too. I think both used Kirby layouts and definitely used Kirby/Lee plots. 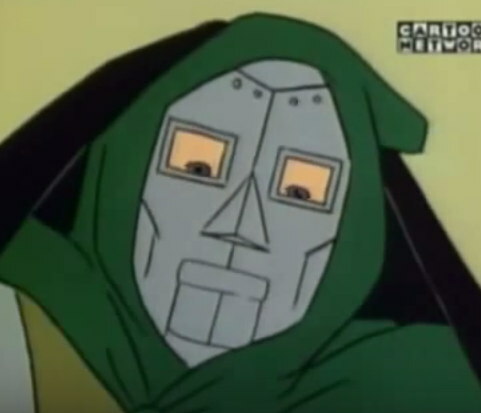 The Doom with an accent was from the 1990’s FF series, I think. He sounded like Ahnuld, and it really didn’t fit at all (IMHO). Oops, sorry about that, Earl! I’ve edited the post to address my error! “About Nine” makes sense based on the lingering assumption that each arc/collection will be six issues. The Golden Age was six issues. Gaiman and Buckingham made three issues of Silver Age though of course only two were published. So they just need three new issues for Silver and six after that for The Dark Age. No harm, no worries, thanks so much for the post! I really miss these cartoons sometimes, wish they were available here on DVD (they are available in the UK, but not here, not on official dvd anyway).